My design wall today is the coffee table. Though I am almost done with the alternate blocks for my scrappy Irish Chain, it doesn't look much different from the last couple of weeks. Instead I thought I would pull out one of the ongoing projects from the Rainbow Scrap Challenge and think about how it should go together. I was thinking of a diagonal setting, alternating with hourglass blocks, though a straight set gives a nice chain effect. Maybe I should do nine patches of the nine patches and alternate them with simple setting squares? 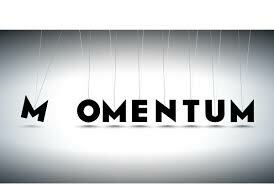 I am only 4 months into the year, so there is still plenty of time to ponder the possibilities. The blocks are made from 1 inch strips and finish at 2 inches so it will take quite a few of them to end cover a bed. I finally sat down for a few minutes this afternoon to churn out a few more neutral blocks. These are 2.5 inch nine patches to add to the collection of colors from earlier months. Still no neutral houses, but I might play catch up before I start in on the yellow. The first round of end of course testing starts tomorrow, so things should start to slow down at work, I keep saying that, but eventually it will be true. 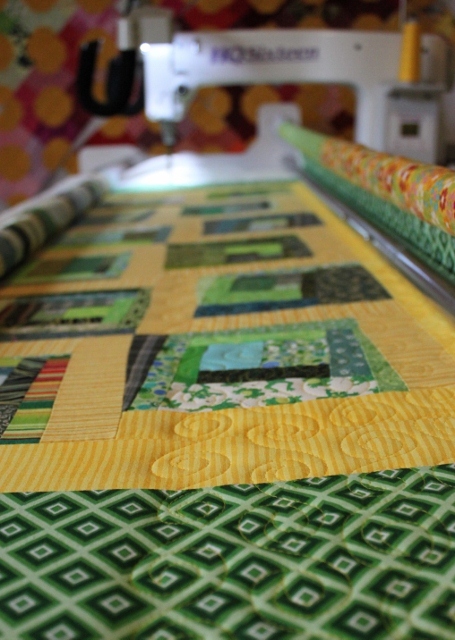 The advantage of keeping something loaded and ready on the frame is that it lets you jump in and do a little bit of quilting when there is time. 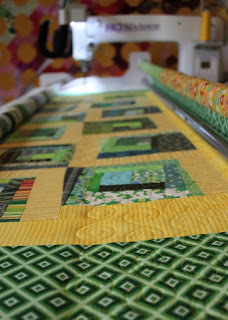 I quilted a few rows this morning before taking the girls out for lunch, shopping and a movie. I am back now and will get few more rows in before doing a bit of housekeeping and settling into essay grading. Summer isn't far off when I can quilt with no guilt. Until then I will tide myself over with a row at a time. Maybe it is fitting that the last neutral Saturday almost slipped away unnoticed. I realized as I was on my way into school this morning that I hadn't posted yet, but there wasn't much to be done at that point. Blogs won't come up on the district network and misterlinky doesn't work on my phone. I'm home again now, after a full day review session for students getting ready for the AP exam. As exhausted as I am from a huge day of nonstop organization and controlled chaos, a little quite time in the sewing room might be just about right. What are you up to on this last Saturday of April? Use the linky below to share any progress for the month, be it beige, or catch up , or otherwise. I've been spending the evenings lately doing school work. I took a break though to think about color schemes for a new quilt. First I'd better finish off some old quilts, but after that, I was thinking of a beach scene. What do you think? So we started today with a faculty meeting, a very nice lady came in from the United Way to thank us for all the money we had donated as a school and talk about all the great programs they used our donations to fund. One of them was a free income tax preparation service for poor families. She said anyone making less than $50K a year qualified. We all wanted to know where we could go to sign up. This Midget Block is called Flower Basket. It is another of the extra blocks from the midget applique set which can be purchased from Sentimental Stitches. I really like the basket fabric, but I think the purple is a little pale. I need to find some more greens for leaves, they seem to come up a lot. I have now completed 90 blocks, though only 82 have posted. That means I have the next 8 Tuesdays ready to go, enough to get me through the end of the school year and into summer vacation. I am thankful for the buffer as the next few weeks will be extra busy with computer based testing and weekend review sessions. Speaking of which, I'm off to finish a test and pick out some excellent essay questions. Camping took up most of the weekend, but I spent a little bit of time on Sunday making some of the alternate blocks for my scrappy Irish Chain. It has been a background project for quite a while now, but I think I have enough blocks to finish up a twin sized quilt. Be sure to check out Judy's blog to see what everyone else was up to this weekend. I am so sorry that the linky post for scraphappy Saturday was late. I set it up to post early this morning, but somehow it was still in the draft folder and didn't go live as scheduled. Though I was able to check from my phone, I wasn't able to fix the problem until we got home again. National parks don't have wifi! We were camping this weekend. If not for the threat of soaking rain moving in overnight we would still be there munching s'mores in the great outdoors. 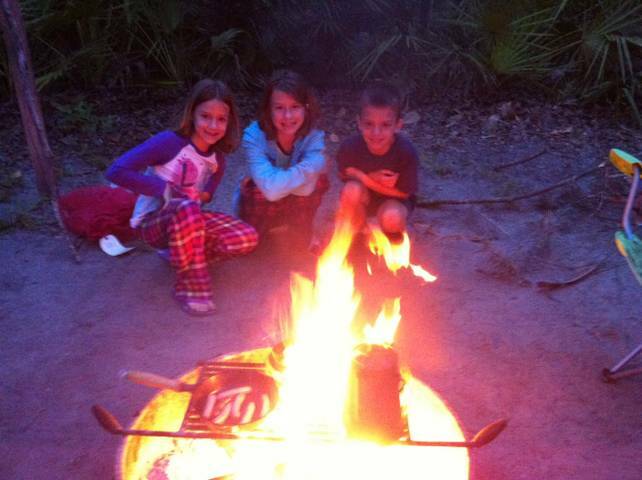 We cooked over an open fire, hiked the nature trails, sang campfire songs and canoed through a marsh. 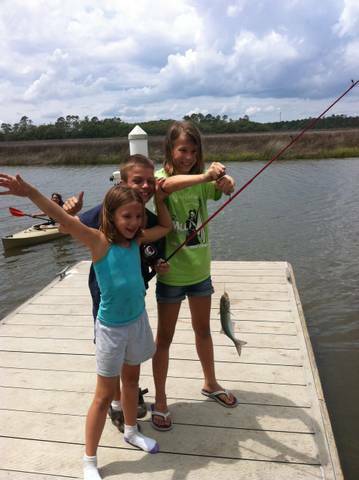 The best moment of the weekend though, was when the kids, with a toy pole and bit of leftover hotdog, managed to catch a fish. We were all caught by surprise! Never expecting them to be successful, Kurt and I were lounging on the deck completely unprepared! We didn't have anything to keep and clean him for dinner, so instead we got a couple of quick photos before letting the little guy loose. Happy ScrapHappy Saturday! Though I am camping this weekend, I hope to be able to sew again on Sunday. I did use a neutral background to try out a miniature circle of geese. This would be awesome as a collection of monochromatic blocks. If only I hadn't already started so many projects this year I would be adding this to my list. Instead I made it midget size and will add it to my growing collection of 4.5 inch blocks. 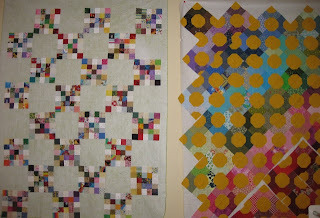 Sampler quilts are a great way to avoid too many ongoing projects. I got home from work today to find a box of fabric happiness had been delivered. I love fabric in the mail! Mostly I was shopping for sale fabric. What can I say? I'm thrifty. I also picked out this bundle of solid fat quarters as well as some silk thread for applique and a bottle of glue baste. I love free shipping with orders of $50 or more. I also came home from work to find the bug guy turning my kitchen into a toxic wasteland. We've been invaded by a combination of ghost and white footed ants. Oh, and two of our three air conditioners are broken. There are downsides to living in a tropical paradise. So worth it though, in case you were wondering. So I was headed out to work this morning, headed up toward the causeway as always when I saw a space shuttle piggy backed onto an airplane flying out over the beaches. They were taking the Discovery to DC to live at the Smithsonian. It made me think about how much I love where I live. Couldn't get photo, being in the car and all, but believe me when I tell you it was a terrific. (Photo above taken from my front lawn during an earlier launch). Last night we all packed a picnic and headed to the park to have dinner. 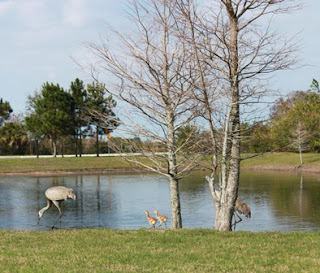 There was a flock of Sandhill Cranes frolicking in the field disturbing a group of kids playing frisbee. Not a bad place to call home. People come here for vacations, but here I am, every day of the year. This is the same flower block that I did a few weeks ago while experimenting with the freezer paper outside applique method. I lost most of my seam allowances on that one and decided to try again. Eventually I realized that the petals were not all the same width. I made all of the petals chubbier this time and it worked much better. I don't like the fabrics as well as the last block, but the technique is much nicer. I will still call it Alstromeria though, because I want to, and that is a good enough reason for me. It is hard to see in the picture, but I am in the Cancun airport finishing up this block and our airplane is in the background waiting for us to board. I am posting ahead right now, so by the time this publishes vacation will be just a fond memory. After getting the green crumbs sewed together into a flimsy I had a design wall open and waiting. With way too many leaders and enders project in the works, choosing a stack of blocks ready to go was an easy task. In the two inch block box I had a stack that had been sewn into Irish Chains. I think there are enough in there for a quilt if I just make the alternate squares. No movement on the bow-tie blocks. I ran out of the cheddar fabric and need to find something for setting triangles. 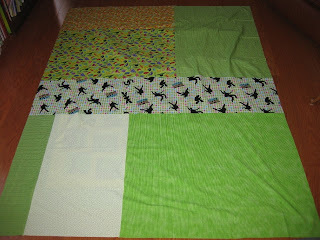 This was the top for the green crumbs though I forgot to get a picture after the borders were attached. I had a green and yellow print big enough for the back, but it was pastel. Instead I pulled anything off of the shelf that was bright green or yellow. It didn't take too long to get those puzzled together to make a back. It is on the frame now waiting for me to have time to get to it. Fortunately fabric is patient and won't go bad before I find the time to sew again. 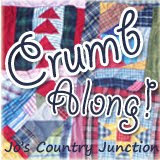 I just finished putting the binding on the crumb quilt from the crumb along at Jos Country Junction. It started in September of 2011. September is a silly time for a teacher to start a new quilt, but it did manage to get finished within the same school year. I quilted black loop-de-loops which don't really show up much on the black background, but they went quickly and were fun to do. I'll save the hand work on the binding for TV time or the next long car trip. The green crumbs are next on the list. I have a green fabric for the border. I hope there is enough. 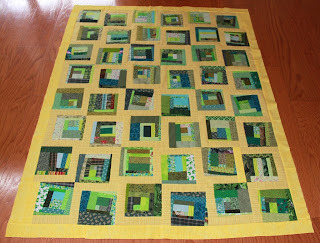 If not I might end up with two green borders as I think there needs to be quite a bit of green on the outside. The yellow ended up being dominant in the center and it needs some balance. If that doesn't work I'll pick something up this afternoon. Sydney has a birthday party which is down south by the fabric store. I also need to get some more cheddar for the setting triangles on the bow-tie blocks. Kurt and the girls took Lizzie to the beach this morning. All the local beaches used to be closed to dogs, but they have just opened up a section to dogs. She seemed to like it, though she would only go in the water up to her shoulders. Finally pulled out my neutral scraps today! The log cabin blocks on the right will finish at 2.5 inches and the string blocks on the left need to be de-papered and squared up to 4.5 inches. Anna is baking a cake, Ryan is gone on a sleepover and Sydney has gone swimming at a neighbors. I think Kurt is finishing our taxes. Maybe I should sneak back in for a few minutes and start on some houses? As much as I have loved seeing all the neutral blocks that people are coming up with, I haven't felt inspired yet to really dig into my neutral scraps. I did get this midget block started last night, but there are no neutrals in it. Today is the day though, I can feel it. 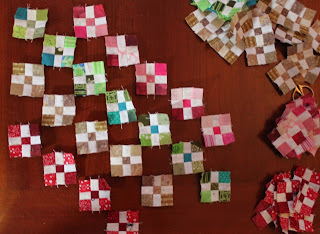 I was madly paper piecing last night, so I might start today with some little houses or log cabin blocks. How about you? 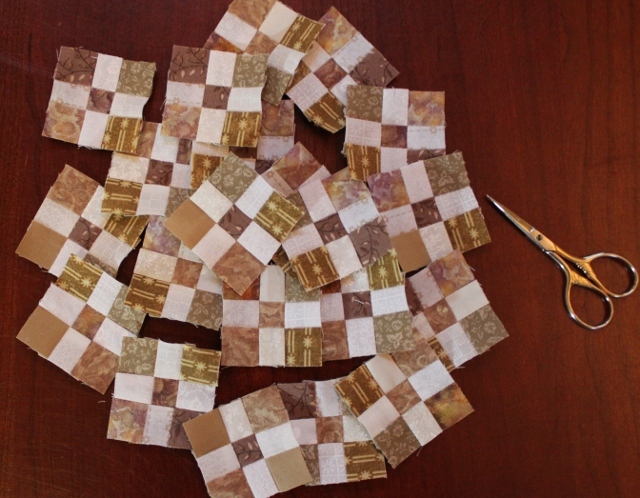 Any fun neutral based blocks churning in your sewing rooms? I found the coolest rainbow postage stamp quilt while wandering aimlessly yesterday. I think I've seen it before, but check it out for inspiration. This might not look like most people's idea of nirvana, but I can't imagine a better evening. Kurt and the kids are having a Top Gear marathon and I am squirreled away in the study making a mess. Paper piecing isn't the neatest of methods, but it sure is fun to trim away all the ragged edges and end up with pretty little points. I've got one midget block done and two more ready to go. No peeking though, I'm posting one each week on Tuesday and have worked my way ahead into the end of May. Just think of how far ahead I'll be when summer vacation hits! Must do some school work this weekend though, along with a Girl Scout trip and normal weekend fun. For now though, I'm off to make some more scraps. This is Midget Block #77. It is officially called Rising Sun. However, I sewed it on the airplane on the way back from our Mexican Vacation, so I am going to call it Mexican Star. It is my block, I can rename it if I want to! This one was hand pieced, with lots and lots of inset seams. It was trickier than it looks because of the asymmetry of the star points. It is hard to tell by looking, but half of the points are larger than the other half. That means that the brown background pieces have a left and a right which was a little tricky to figure out on crowded bumpy airplane. I finally measured and marked each of the sides as long, medium or short and then matched up the short side with the small star points, the medium side with the large star points and the long side with the outside edges. After that, getting the background corners mitered seemed easy enough. I was just sewing the last seams as we touched down in Miami. I am starting to get the hang of the whole hand piecing of inset seams routine, but I started on a curved block today that might just exceed my skill level. Bonnie Hunter posed the question today, "What's on your bed?" I had to laugh, because Bonnie Hunter is on my bed today. At least her quilt design is. I think this pattern was called Spinning Stars. 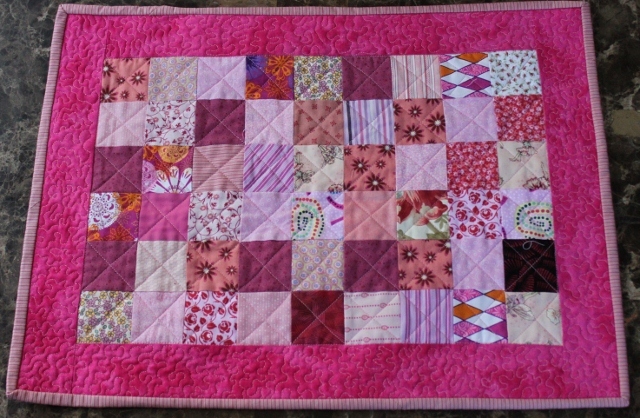 Originally is was in Quiltmaker magazine, and I seem to remember that it used 2.5 inch strips. I used 2 inch strips, I guess because I had more of them at that point in time? Hard to say, but after sewing a few hundred blocks, I thought they needed to be broken up a bit and added the extra green strips to separate the quilt into quadrants. 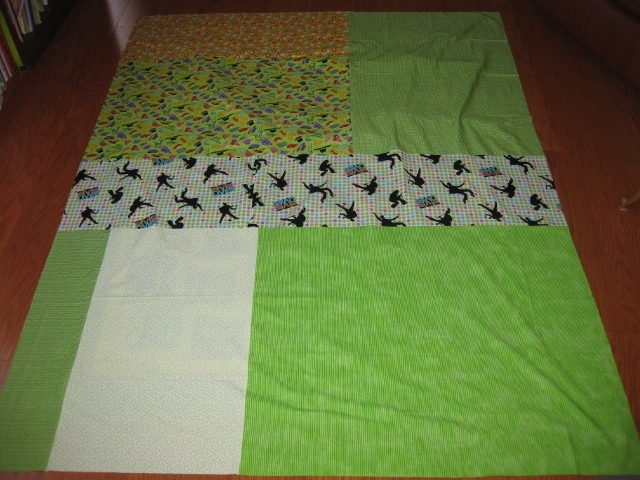 The checkerboard border followed along with a few more to make it fit on the bed. I don't have that many quilts that fit on this bed, so this one gets quite a lot of use. So what is on your bed today? Go over to Quiltville to play along. I hope everyone is having a relaxing and rejuvenating Easter Sunday. I tried sneaking into the sewing room first thing after the egg hunt this morning but was pulled back into a round on house cleaning that lasted until lunch. Hopefully that silliness is over and I can get back to my little hideaway soon. I put yellow sashing strips on two sides of my green crumb blocks to give them a less formal feel than a lattice and cornerstone treatment. I think I still need to randomize the rotations a bit more. After that I pulled all the cheddar bowties out to see how close I am to getting that one done. It has been ages since I finished anything and I am starting to feel that there are too many irons in the fire. Yesterday we went to a HUGE Easter party that a good friend hosts every year. The kids have all been looking forward to it for ages and were so excited to get all dressed up and smash confetti eggs on all their friends. I've been sweeping up leftover confetti all day but the kids are already looking forward to next year. I hope you all find a little bit of time to sew on this long holiday weekend. April is the neutral month, so feel free to work with neutrals alone or mix them with another color to catch up or work ahead on whichever pile is the biggest. 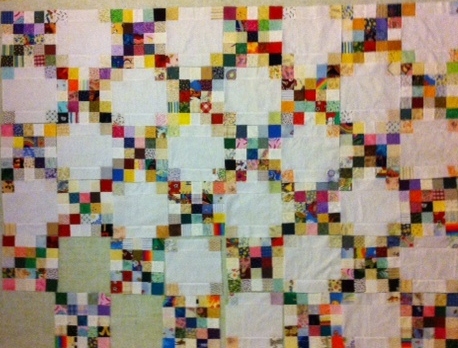 I spent yesterday taming scraps and now feel great about sewing away a little bit of the day. Use the linky below to share your own scrappy progress. So my day off started with a trip to the dentist, a visit from the air conditioner repairman and a piano lesson. By lunchtime I was all out of errands and happy to settle down with a pile of scraps. It seems like I just had an extravaganza of scrap taming, but the basket was full again and waiting to be sorted, cut and put away. Lizzie is keeping me company, snoring away at my side. It is good to have company. Kurt volunteered for the afternoon round of errands and has taken the kids off for haircuts, Easter shoes and pool chemicals. 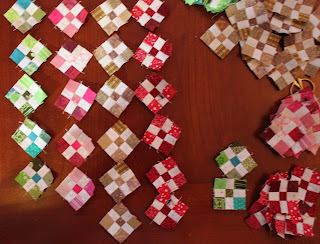 I'm itching to sew something, but first I'd better finish off my little piles of chaos. This is Midget Block number 57. It is called Snowball Wreath. I finished it on the way to Cancun. The star in the background is paper pieced and then the little circle are four patches that are shaped into circles before being appliqued. I used the freezer paper on the outside technique for this one, and I am liking it a lot now that I have gotten the hang of it. I think I will order some of the glue that comes in the little needle tip squeeze bottle to keep the pieces in place better. Doesn't the block look even better in Cancun? This was the view from the balcony in our room. I know it is a new month, but I wasn't quite ready to put away my pink scraps yet. I didn't have much in the pink jars to make crumb blocks. Instead I pulled out some 2.5 inch squares which I sewed together into nine patches. 6 of those with a border turned quickly into a pink place-mat to go with the red and green from earlier months. Anna has claimed this one as her own, in two more months there will be one for each of us. So now that I am officially ready to switch over to April, I'm ready to go and pull out my light neutral jar. It is stuffed full of white, cream, ecru, anything that would work for background. I might see if I can separate it into very light and not quite as light to get enough contrast for a block or two, otherwise I'll catch up on string blocks for Jamestown Landing. There are a few inspiration quilts linked on the RSC12 tab at the top of the page, be sure to check it out if you are stumped. And, just because coming home from vacation is so hard, here the view from the balcony of our room at the resort in Mexico. Now, back to life as usual. I am on a manic midget binge. No actual blocks to show for now, but my Tiny Tuesdays are scheduled to post all the way into May! I have officially finished off the first two binders which hold blocks 1 - 60. There are plenty of finished blocks in the other two binders as well when I went out of order for handwork on trips and vacations. Now I definitely need some simpler power piecing. I think I'll go see what is easy and ready to be finished off. It is nice to be home again, catching up on laundry, hanging with the kids. Life is good.